Are you a powerful creator? Do you feel like you’re already tuned to a higher frequency but want help getting the most out of your gifts? Are you ready to lovingly let go of whatever’s holding you back and start living your highest potential? For those of us that are open to the guidance the Universe offers to us, we know how easy life can be when we get out of the way and allow things to flow, rather than trying to do it all ourselves. 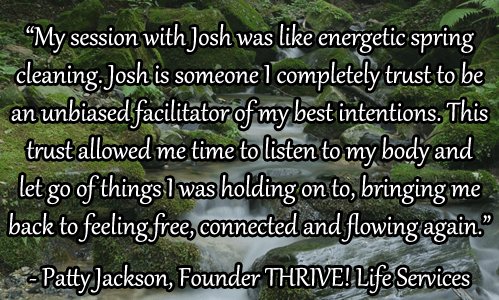 I’m here to help you enhance your connection to your highest guidance, so you can act with clarity, confidence and knowing. We’ll achieve this by tuning into the stream of loving energy flowing directly from Source and actually seeing you and the things that are most important to you through the eyes of Source. We’ve all picked up distorted ideas of who we are from time to time, whether by listening to someone else’s perspective on us, or mistaking an unwanted manifestation with the idea that we’re doing something wrong. But no matter how gunked up your perspective may get from time to time, you have the capacity to tune in and see the truth about who you are and why you’re here. You deserve to be loved for who you are. Not who you’re planning to be. Not who you need to become first before you’ll believe you are lovable. But who you are right now, in this very moment. This healing ritual will help connect you with the love the Universe has for you. I will completely surrender to spirit and allow healing tones, chanting, and inspired movement to flow from me and help both of us shift to a higher place where we can truly appreciate and celebrate who you really are. My ability to receive energy began about five years ago when I was inspired to meditate every day for about a month and half. During the meditations I noticed that my arm started moving itself in a circular motion. 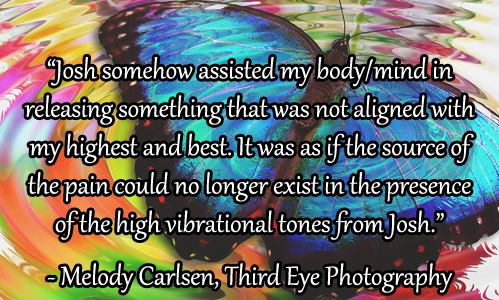 It felt really good, as if I was tuning into the energy of the meditation and allowing myself to more fully embody it. Since then it has evolved into sounds as well. Everything from animal noises to chanting to speaking in tongues to excited noises such as “weeeeeee!” I even find myself saying “yes, yes, yes!” when I strike a chord with a particularly powerful vibration. My movements have also become more advanced. When I’m doing a healing session my body will sometimes contort itself into yoga positions that I don’t even practice regularly. And other times when I’m extremely tuned in, it’s almost as if I’m doing a martial arts style dance with the energy. All of this was fun, and unique, and I really enjoyed it; I just never new how to share it with others so that it could benefit people beyond me. Then in December of 2015, someone from one of my meetup groups reached out to me and asked for some life coaching. When I went over to meet with her, she very quickly resonated with my movements. 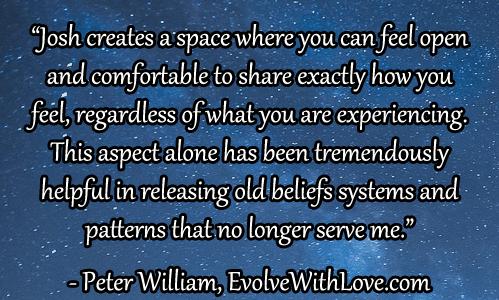 I was simply tuning in so I could be more present and insightful, but the next thing I knew I was using my movements to interact with her energy field. Since then we’ve done about 10 more sessions, each evolving into deeper connection. Her psychic abilities become extremely clear when I’m working on her. And even though she is in chronic pain (despite taking heavy pain killers), within a few minutes of working together she finds herself completely pain free. Each session is different, even multiple sessions with the same people tend to evolve a lot from session to session. However my biggest breakthroughs have come with clients who are already in a good feeling place and are looking to step up to a higher vibration. 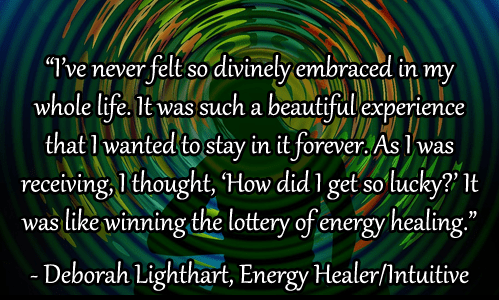 I find that working with other healers, or people who are just very in-tune with their energy field, allows us to take this energy to high flying places we’ve both never gone before. Since I’ve started doing healing sessions I find myself more tuned in than ever. I’m now at a point where I’m wanting to share this with more people. I feel as if I’ve kept this gift to myself for far too long, and now I want to let loose and see what good I can do in the world. 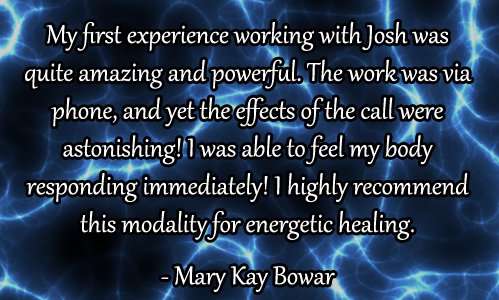 Schedule a remote healing session with me today!